Another step on the road to bankruptcy. SH 130 Concession Co. filed a bankruptcy reorganization plan Friday that proposes transferring company ownership to its largest lenders, which include the Federal Highway Administration and a group of European banks. The company owes more than $1.6 billion. It is owned by Spanish road developer Cintra, the majority stakeholder, and San Antonio-based Zachry American Infrastructure. The company paid TxDOT $125 million upfront for the rights to operate the road, which was built to bypass Interstate 35 traffic between San Antonio and Austin and then became state property. It also agreed to share some of its toll revenue with the state as part of the lease agreement. Texas 130’s southern section, which connects to a state-operated section that ends in Georgetown, opened in 2012 and became known for its 85-mph speed limit, the highest in the country. But it immediately missed the company’s traffic projections, and Moody’s Investors Service assigned its debt a junk-bond rating three years ago as a result. The company issued a substantial amount of debt to finance the $1.3 billion project. It owes about $551 million on a Transportation Infrastructure Finance and Innovation loan from the Federal Highway Administration, and about $721 million on its bank loans, according to court filings. A FHWA spokeswoman was not available for comment Friday afternoon. The reorganization plan proposes that SH 130 Concession Co., under its lenders’ ownership, would continue to operate and maintain the road. The plan has yet to be approved by the court. See here, here, and here for the background. Cintra and Zachry will take a bath if this goes forward, which is fine by me. I’m less fine with the Federal Highway Administration getting stiffed, though it’s not clear from this story if that may happen. I’m not sure there’s any lesson to be learned here beyond the obvious one of not building roads where there are no people, but I hope we at least grasp that one. The SH 130 Concession Company, a partnership between Spain-based Cintra and San Antonio-based Zachry American Infrastructure, opened the 41-mile-long southern portion of the State Highway 130 toll road, from north of Mustang Ridge to Seguin, in October 2012 to much fanfare. In addition to the record 85 mile-per-hour speed limit, the company signed an unprecedented deal with the state to build and operate its section of the road for 50 years in exchange for a portion of the toll revenue. SH 130 Concession Company CEO Alfonso Orol said in a statement that the road will continue to operate while it goes through Chapter 11 bankruptcy proceedings. See here and here for the prior steps towards this seemingly inevitable point. The Statesman adds on. The building boom in Central Texas has largely bypassed Lockhart (located just east of Texas 130) and Caldwell County, and several large developments announced along the corridor are still only in aspirational form. As of 2014, when the road had about 16,400 toll transactions a day, traffic was about 30 percent below the projections used in borrowing the money for the road. Original projections for 2015 and 2016 weren’t available Wednesday. But use of the road, while not enough to meet the company’s financial obligations, has been improving. According to SH 130 Concession, the road had 5.15 million transactions in 2013, 5.99 million in 2014 (a 16.3 percent increase) and 6.9 million in 2015 (a 15.2 percent increase). See here for all my SH 130 blogging. Will this actually affect operations of this ill-fated road? Who knows, and who would be able to tell if it did? I’m just wondering what the next stage of this story is. Just ask the Texas 130 investors. Moody’s Investor Service has downgraded the credit rating of the private company that built and operates the Texas 130 toll road extension, a rating that could continue to drop unless traffic “aggressively” grows on the road in the next two years. SH 130 Concession Co., a partnership between Spanish-based Cintra and San Antonio’s Zachry American Infrastructure, on review in March. The toll road, from Seguin north to South Austin, was billed as the nation’s fastest when it opened to drivers in late October, boasting an 85-mph speed limit. But traffic counts on the road are about half the initial projections, the Moody’s report said, forcing the company to dip into its financial reserves to make loan payments and raising concerns about the possibility of future default. A downgraded credit rating can indicate a greater risk to bondholders. The report lists the company outlook as negative, which indicates the possibility of future credit downgrading in the next one to two years, Moody’s communications strategist David Jacobson said. See here and here for the background. As EoW notes, the real issue is that Texas taxpayers will be on the hook for this in the event of a default or other inability by Texas 130 to pay. Keep that in mind if transportation funding gets added to the call of the special session as Sens. Williams and Nichols have requested. Traffic counts on the new section of Texas 130, released Friday by the Texas Department of Transportation based on newspaper open records requests, show that the tollway southeast of Austin in its first couple of months was seeing fewer than 3,000 vehicles a day. About 5 percent of those were big rigs in the 10 weeks between the road’s Oct. 24 opening and the end of the year, the period covered by open records requests filed with TxDOT by the American-Statesman and the San Antonio Express-News. The road saw 132 trucks with trailers per day between Mustang Ridge and Lockhart, and about 100 a day between Lockhart and Seguin. Interstate 35, several miles to the west, saw more than 100,000 vehicles a day in 2011 counts taken by TxDOT. The early numbers are about half of what the company predicted in 2008, according to Moody’s Investor Service, which is investigating whether credit ratings on the company’s $1.1 billion in debt on the road should be downgraded. The concession company, owned by a partnership of Spain-based Cintra and Zachry Construction Co. from San Antonio, spent about $1.3 billion building the road and paid TxDOT $140 million in lease payments. That’s not a lot of traffic. The earlier story we heard was that the daily vehicle count was only about half of what had been originally estimated, but it didn’t say what that number actually was. I’m not sure what’s more remarkable, that the estimate was off by so much, or that 6,000 vehicles a day was considered worthwhile, at least at the beginning, for this project. If it’s mostly pass-through traffic that’s using SH 130, it’s certainly beneficial to get those vehicles off of I-35, but you really have to wonder how sustainable this is, and whether there might have been a more cost-effective solution. The privately operated section of the Texas 130 tollway south of Mustang Ridge is attracting about half the predicted traffic, according to Moody’s Investor Service, prompting it to investigate downgrading credit ratings for more than $1.1 billion in debt attached to the toll road. TxDOT’s contract with the concession company lays out complex procedures to determine how much TxDOT would pay the concession company to take over the road in the event of a default or for any other reason. The Moody’s report doesn’t mention the possibility of default. The transportation commission — which has operational control of Texas 130’s northern 49 miles but not the Cintra-Zachry section — [approved on Thursday] cutting truck tolls by two-thirds for the next year on the tollway as well as on connecting toll road Texas 45 Southeast. Multi-axle trucks, beginning Monday, would pay the same tolls as passenger vehicles and pickups. The concession company has agreed to charge all vehicles the car rate as well during that period. That means that a truck, rather than paying as much as $61 to travel the entire 90 miles of Texas 130, would pay just over $17. In both cases, those are the pay-by-mail rates. A truck equipped with an electronic toll tag would pay 25 percent less. TxDOT, in announcing the toll reduction for big trucks, said it was done to ease congestion on parallel Interstate 35. But the change, which TxDOT estimates will reduce toll revenue on Texas 130 and Texas 45 Southeast by $11 million over the next year, also could introduce some truckers to the high-speed tollway. 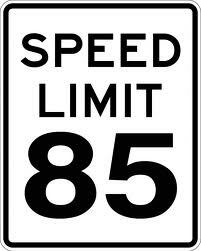 The speed limit is 80 mph on the TxDOT section and 85 mph on the Cintra-Zachry section. So maybe this isn’t the pathway to prosperity that the city of Lockhart dreamed it would be, though it is good news for the hogs. Maybe it’s just that the idea of driving 85 MPH isn’t quite as appealing as we thought, at least not at these prices. Who knows? Let’s just hope TxDOT doesn’t get stuck holding the bag. The Trib notes a side issue relating to the speed limit on the service roads for SH 130, and EoW has more. The Texas Department of Transportation has approved an 85 mph speed limit for an upcoming 40-mile stretch of Texas 130 from Austin to Seguin. Currently, no road in the country has a posted speed limit faster than 80 mph. An 85 mph designation would give the new toll road the fastest speed limit in the Western Hemisphere, according to some reports. In 2011, the Legislature gave TxDOT the authority to grant an 85 mph speed limit to roads designed to accommodate that speed. Last week, following engineering and traffic studies conducted by TxDOT, the Transportation Commission authorized speed limits of up to 85 mph on the road. The new stretch of Texas 130 (known officially as Segments 5 and 6) is being built by a private consortium led by Spanish-based toll road firm Cintra. The firm has spent $1.3 billion to design and build the road and collect the tolls on the road for 50 years, though TxDOT retains ownership of the road. Under TxDOT’s contract with the SH 130 Concession Company, the firm had to pay TxDOT an extra $67 million if the new road received an 80 mph speed limit. If the road received the coveted 85 mph speed limit, TxDOT’s bonus jumped to $100 million. Wait, so by approving this higher speed limit TxDOT also approved a $100 million bonus for itself? Sweet. The road is officially scheduled to open November 11, but may actually do so sooner than that. See here for more. The Sierra Club lawsuit to stop construction of the proposed SH99 toll road over the Katy Prairie will see its day in court by September,according to KUHF. The Sierra Club filed suit against “the Federal Highway Administration due to the failure of that federal agency to do an adequate assessment of the environmental impacts of the proposed Grand Parkway Segment E in western Harris County,” according to the Lone Star Chapter of the Sierra Club. The Texas Department of Transportation, however, is moving forward with proposed SH99 toll road across the Katy Prairie, having received 23 letters of interest in a public private partnership to build the toll road, according to Project Finance. A list of the companies that responded is posted on the department’s Web site at www.gpprocurement.com. Their submissions, which were due July 6, have not been made public. The list includes San Antonio-based Zachry Construction, which was also part of the Trans-Texas Corridor consortium; Balfour Beatty Capital, a U.S.-based arm of an English company; and China Construction America, a subsidiary of China State Construction Engineering Corp.
Robin Holzer, Citizens Transportation Coalition volunteer board chairwoman, said the coalition has no opinion about the firms on the list but is concerned about the details that end up in eventual contracts. Yes, I have a feeling that the public is going to be a substantial part of that public-private partnership. As for that lawsuit, it was filed in March of 2009. I don’t find any mention of it in my archives, so it escaped my notice at the time. You can see the Sierra Club’s complaint here. We’ll see how it goes.